(Figure 2, Item 3) and return manifold connector (Figure 2, Item 5). Start engine and run at 600 RPM (TM 55-1925-205-10). The compression in any cylinder must not be less than 450 PSI (3,102.6 kPa) at sea level. The variation in compression between cylinders must not exceed 25 PSI (172.4 kPa). Record compression reading shown on pressure gauge (Figure 2, Item 1). Repeat Steps 6 through 11 to check compression in each of the remaining cylinders. connector (Figure 2, Item 5). Remove adapter (Figure 2, Item 2) and pressure gauge (Figure 2, Item 1) from injector orifice. Figure 2. Fuel Pressure Gauge and Adapter. 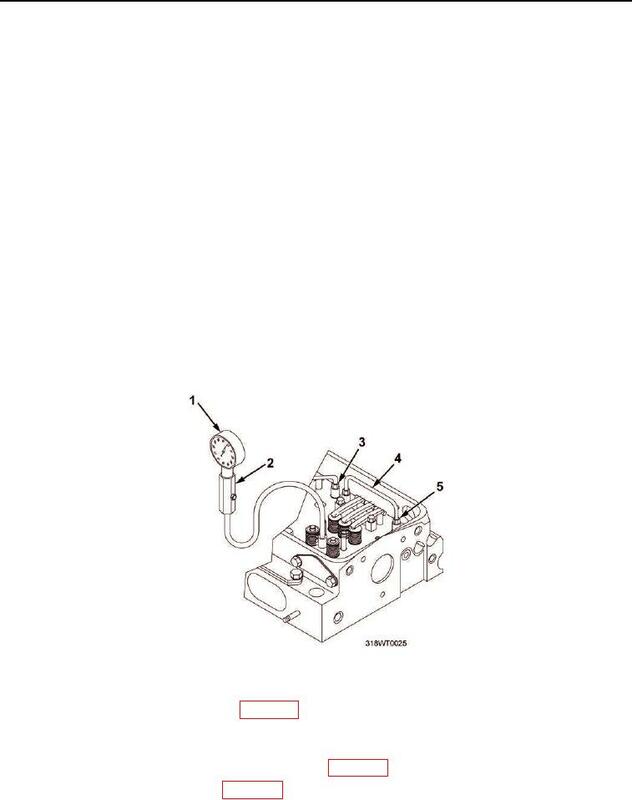 Install fuel injector (Figure 1, Item 4) (WP 0091).